With Rob on holiday somewhere exotic it was down to Hurf and me to organise the first match of the Summer League. Well, I say me but when I arrived at the Royal Oak just after 8:30, Hurf looked to be in total control (and with a hangover too!) so I ordered a sausage sarnie and coffee and said hello to everyone. I knew the match was going to be well attended but with 18 booked in, it was a great turnout. 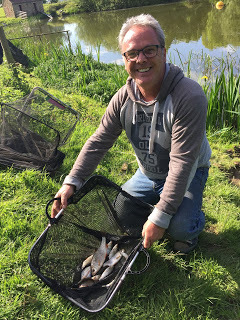 Along with all the regulars, it was nice to see Jess Jordan who was fishing with us for the first time along with Alvin Jones who hadn’t fished the pond for years and John Dursley who was only fishing it for the second time. It was also lovely to see Richard White for the first time in ages. Hurf announced the draw and Harry asked me to draw for him to see if he could get away from the far side and I managed to pull out 13 for him which put him on the bottom bank. I then grabbed a peg for me and opened my hand to reveal 24 and I have to say I always have mixed feelings about drawing it because the swim has a big bush on the left which holds some rather large chub but it can be a hero or zero peg. I have done well off it in the past by ignoring the bush and just getting my head down and fishing for roach which is what I hoped to do today. But it was also in the back of my mind that with so many anglers around the pond a swim with some cover might be a bonus. Big Frank was on the other side of the bush in peg 1 and I had John Dursley on my right in peg 23 and if I’m honest I don’t think we should have put that peg in as he was set back a bit in a corner and would be hemmed in by Alvin on peg 22 and me. After getting my box level I mixed up some Bait-Tech Pro Natural before setting my rigs up, rig number one was a 1 gram Drennan Tipo for fishing in open water at 10 metres, my second rig was a little Preston Chianti for fishing up in the water at the same distance and finally rig three was a Carpa 2 for fishing by the bush. 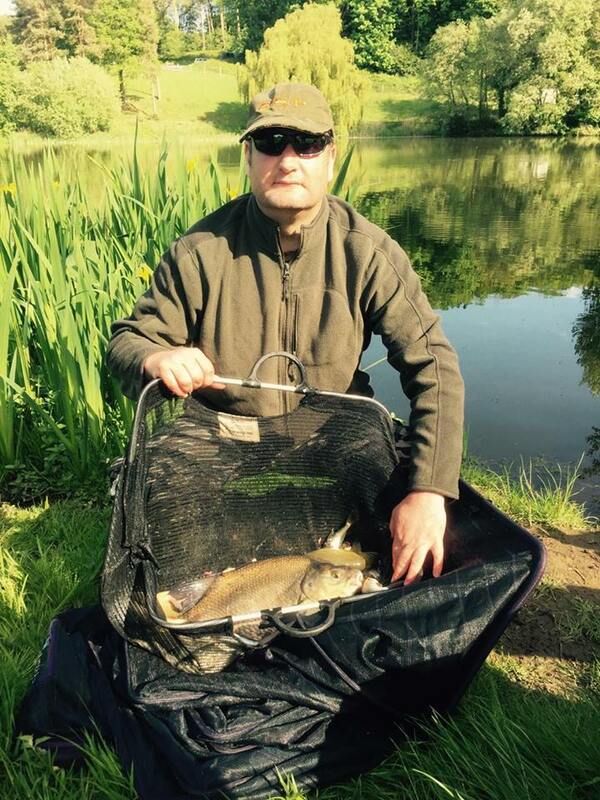 Both the open water rigs had size 18 B611 (barbless) to 0.10mm and the bush rig had a size 16 B911 to 0.14mm. My bait for the day was the usual casters, maggots and hemp but I also opened a small tin of corn and had some pellets to feed by the bush as well. 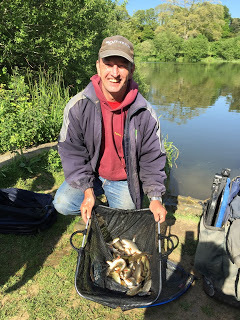 It was bright, hot sunny day and without too much ripple and lots of anglers, I thought it could impact on the weights but I still felt 15lb would be needed to do well. The side bet club (Harry, Hurf, Steve P and myself) all decided to put a pound in the pot for the top weight amongst us. Hurf gave a shrill whistle to signal the start which wouldn’t have been out of place on ‘One Man and His Dog’ and we were off. 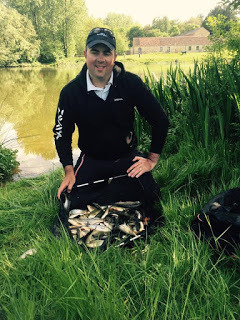 I cupped in two balls of groundbait at 10 metres and then a full pot of grub by the bush at about 7 metres. I started with caster on the hook and it took a while before I had any indications and then I missed a few bites before catching a couple of small roach but after fifteen minutes it wasn’t really happening and I was soon reaching for the shallow rig. 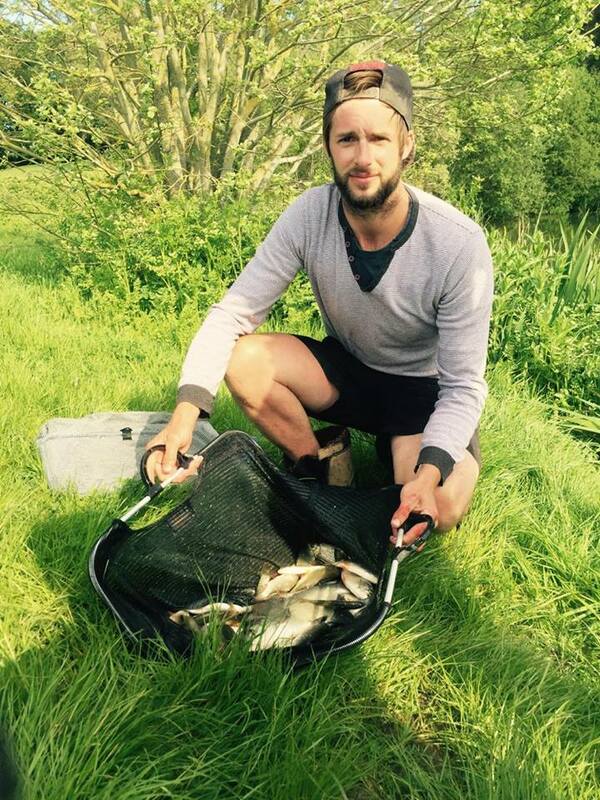 This was much better and I started catching well and was getting roach along with some nice rudd and a couple of chublets. By the end of the first hour I had 20 fish for probably 2.5lb which was bang on my 15lb target and from what I could see, nobody else was catching, so at this early stage it was going well. As the second hour began I had a lovely roach and some more rudd but it was starting to slow up so I started feeding another line just off the bush at 10 metres and swapped between the two, this worked to a certain extent but my catch rate was dropping off rapidly. 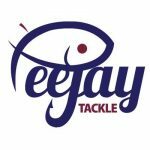 I couldn’t see Ash over on peg 7 but apparently he was catching well and Rich White on peg 2 had landed a nice bream, then Alvin who had caught virtually nothing so far had a decent skimmer followed by another quite quickly. 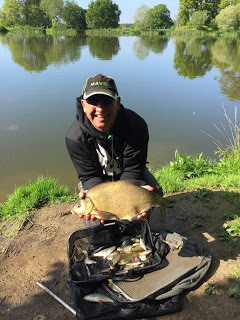 I cupped in some more feed by the bush and would try it shortly, Alvin landed a foul hooked skimmer and then had a proper bream and was bagging up, John was really struggling as were all the anglers I could see on that bank. 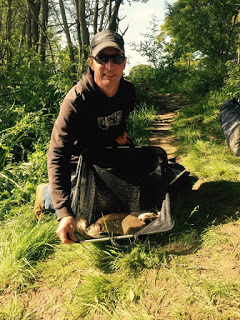 I had a couple more fish but it was now really hard going so I had a quick go by the bush with double caster but no bites after ten minutes and I was scratching my head at what to do next. 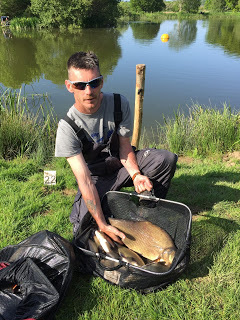 Alvin added another skimmer followed by a big roach and was looking good to frame but apart from him nobody on our side was catching so the section money was still up for grabs. 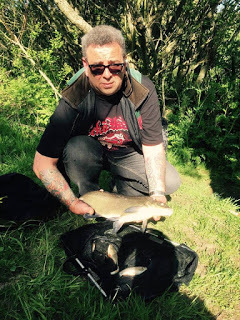 With that in mind I carried on catching the odd roach shallow but then noticed Fieldy playing a big fish and when he safely landed a 4lb slab, I needed to catch a bonus fish myself. Alvin had another bream along with a couple more skimmers so I tried my depth rig again but couldn’t buy a bite. 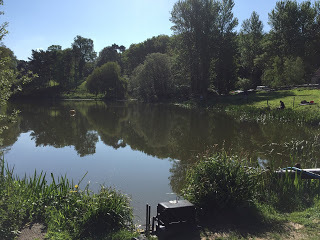 Then Hurf phoned me to let me know he’d just had a good bream too so it was looking like he’d take the side bet pot unless I could latch into a couple of those elusive chub. I kept trying under the bush with double caster and corn but the float never moved and just to make things even more awkward, loads of that floating white fluff that comes from some kind of plant blew into my peg meaning every time I shipped back the rig ended up like a washing line! I got bored after half an hour and went back out with the shallow rig but that had died a death now as well. Alvin had also stopped catching but had probably already done enough to win the match and then John finally landed a decent skimmer so maybe the shoal had moved on. I added very little to my net up until the end of the match and when Hurf summoned his sheep dog to finish proceedings my clicker was reading 55 fish which would probably give me around 4-5lb, not good! Then as I tried lifting my box out of the mud, it was well and truly stuck, I gave it a good heave and it came free minus two of the mud feet which just about summed the day up! I managed to get them back but in the process got covered in pond gunk! 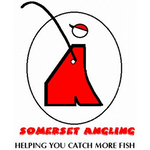 I loaded the car and caught up with the scales after the first couple of pegs in my section had been weighed, Gordon Aplin had 2lb 10oz in peg 14 and Karl had 1lb 5oz from 17, then we got to Fieldy and his bream assisted catch weighed 9lb 4oz, Jess had struggled for 1lb 9oz and Terry Morgan had a level 2lb from peg 20. 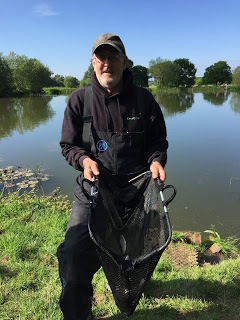 Bob Hammond had a couple of skimmers on the feeder for 2lb 6oz from peg 21 before we got to Alvin who had a lovely net of bream and skimmers for 22lb 6oz, John had 1lb 9oz before my fish went 5lb 15oz which was a little more than I thought and I needed Fieldy to frame to give me a double default section win. 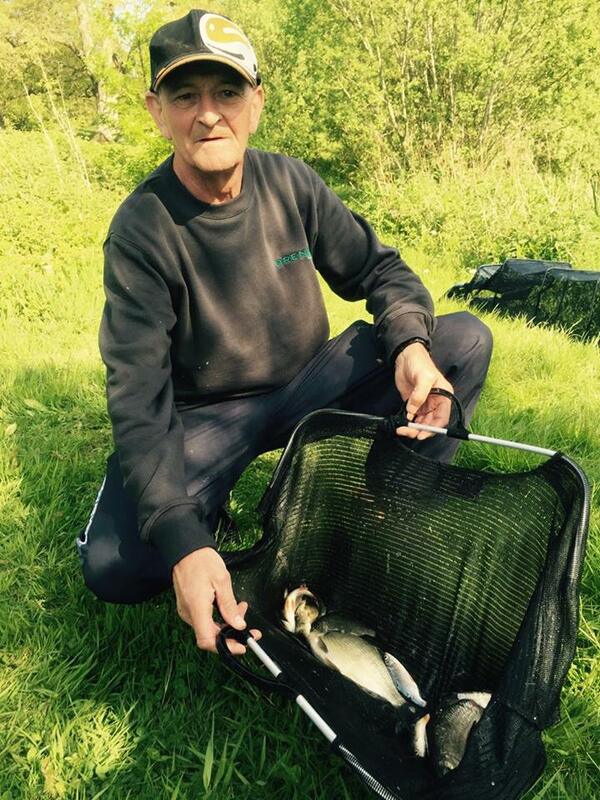 John had struggled for 1lb 9oz but at least he was still smiling! On the plus side, as Fieldy was third I picked up £20 for the section and Justin won the other section. 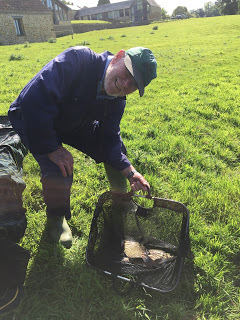 So apart from the leading weights it had fished quite hard although the weather and so many anglers around the pond hadn’t done us any favours. Also several of the roach I caught were really rough to the touch and have either spawned or are getting ready to do so. 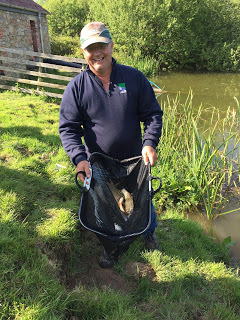 The other interesting thing today was the number of bream and skimmers caught all around the pond and nearly all on the pole. 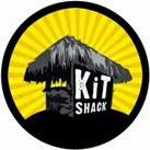 We’re back next week and it could fish totally different again so make sure you come back to see how this intriguing venue fishes then.